Plate 1. Projected surface temperature changes for the early and late 21st century relative to the period 19801999. Values show the atmosphere-ocean general circulation model (AOGCM) multi-model average projections (OC) for the B1 (top), A1B (middle) and A2 (bottom) Special Report on Emissions Scenarios (SRES) scenarios averaged over the decades 2020-2029 (left) and 2090-2099 (right). As shown in figure TS.28 (p. 72) of the IPCC (2007) Fourth Assessment Report, Technical Summary. Plate 2. Multi-model mean changes in precipitation (mm/day). To indicate consistency in the sign of change, regions are stippled where at least 80% of models agree on the sign of the mean change. Changes are annual means for the Special Report on Emissions Scenarios (SRES) A1B scenario for the period 2080-2099 relative to 1980-1999. As shown in figure 10.12 (p. 769) of the IPCC (2007) Fourth Assessment Report, Chapter 10 (Global Climate Projections), Report of Working Group I of the IPCC, Climate Change 2007: The Physical Science Basis. on agricultural production. Downscaling is therefore often needed in order to provide higher resolution future climate forecasts. 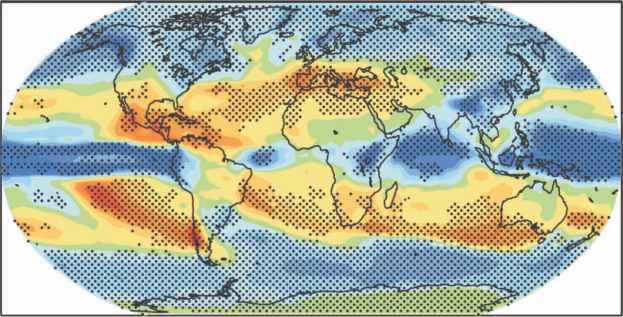 Regional climate modelling (also known as dynamic downscaling) is the most numerically and climatologically stable (and accepted) approach when forecasting climatic changes at finer (i.e. regional) resolutions. RCMs are based on similar physical relations to GCMs, but applied on high resolution (typically 20-50 km) grid cells and within a limited domain (typically 5000 x 5000 km2). They are forced at their lateral boundaries by the output of the GCMs (Giorgi, 1990; McFarlane et al, 1992; Giorgi et al, 1993a, b, 1994; Caya et al, 1998; Lenderink et al, 2007) in order to produce forecasts at regional scales. Since RCMs are based on physics they can, at least in principle, represent the complex interactions and feedbacks involved with climate change. However, like GCMs, they may contain systematic errors leading to uncertainties and they are computationally expensive. Because it is impossible to regularly perform high-resolution integrations of GCMs at high resolutions, it is possible to nest a high-resolution model inside a low-resolution GCM (Dickinson et al., 1989; Giorgi 1990; Giorgi and Marinucci, 1991). The nested modelling technique consists of using coarse resolution GCM to carry out simulations of global climate and then employing the GCM output to drive a high resolution limited area model (LAM) over an area of interest. The basic idea is that the GCM can provide the correct large-scale circulation response to global climatic forcings, and the LAM can describe the effect of sub-GCM grid-scale forcings, due for example to large water bodies, surface vegetation characteristics, or complex topography and coastlines that may significantly influence the characteristics of local climates (Dickinson et al., 1989; Giorgi, 1990). Regional climate modelling adds two types of small-scale information to GCM results. First, it adds information on the local conditions at specific locations. This is typically important when large horizontal gradients occur. Secondly, it adds information on processes that are small scale but which are not necessarily tied to a specific location, like for example frontal systems, small-scale convective precipitation, and other meso-scale phenomena (Lenderink et al., 2007). RCM forecasts are, however, more uncertain than GCM projections of future climates. RCMs are themselves models, and in addition to that, base their modelling approach in the outputs of another model (i.e. the GCM). The spread (i.e. variance) between RCM outputs driven by different boundary conditions is small in comparison to the potential variance when applying a GCM among different boundary conditions (i.e. predictions within different emission scenarios may not differ significantly) (Deque et al., 2007; Lenderink et al., 2007). However, changes in parameterization of RCMs may strongly impact on the extremes (e.g. 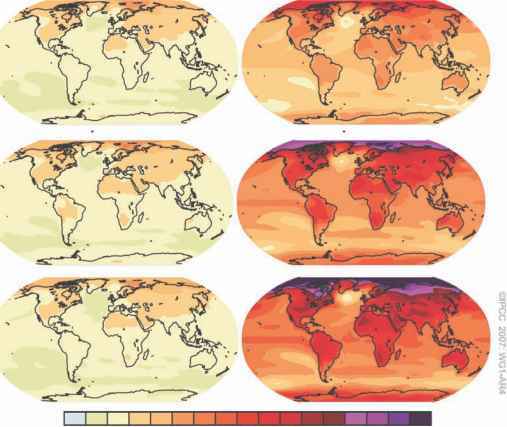 daily temperature extremes) (Kjellstrom et al., 2007). RCM results cannot thus be used directly to produce scenarios that represent the range of outcomes based on the GCM knowledge, mainly because GCM and RCM outputs for a single region may differ significantly in both accuracy and variance. The variance arising from a GCM comes from the numerical approximation to the climate system and the boundary conditions used to run the model; however, variance in RCMs may arise only from the different representation of small-scale physics, which may lead to propagative errors in the forecasting (MacCracken et al., 2004; Lenderink et al., 2007). The evaluation of the quality and usefulness of climate modelling systems is dependent upon an assessment of both the limited predictability of the climate system and the uncertainties stemming from model formulation. One means of assessing the performance of an RCM examines its ability to represent the natural inter-annual variability on monthly and seasonal timescales. While ensemble experiments demonstrate that the predictability of the regional climate varies strongly between different seasons and regions, important sensitivities of the modelling system to parameterization choices might remain uncovered. In particular, compensating mechanisms related to the long-term representation of the water cycle are revealed as a result of unrealistic cloud-radiative feedbacks (Vidale et al., 2003). RCMs have suffered from a lack of comprehensive assessment of their accuracy, due to their difficult access to non-climatic research centres, and the lack of global published data for different models, time slices and climatic variables. Despite that, regional impacts of climate change on agricultural production have also been assessed via RCMs (Guerena et al., 2001; Kueppers et al., 2005; Blenkinsop and Fowler, 2007; Yano et al., 2007; Solman et al., 2008; Nunez et al., 2009).